Did you ever see those labs in the comic books or super hero movies? They’ve got these random parts and wires all over the place, a few minutes later, as the aliens are about to attack they’ve thrown together an Iron Man suit or programmed the planetary defense shield. You and your kids can (sort of) be that guy, or, in my grandkid’s case, girl. Now, that was just crazy talk. IBM built computers and they were massive. Plus, you’d need a keypunch machine unless you had one of those dumb terminals (not being perjorative, that was the name). So, we went to the party. There was beer and also an honest-to-God computer that Bob had built from parts he bought from Radio Shack and other hobby stores. The internet didn’t exist yet, so there was no buying on line. The computer didn’t do much, and it was taller than me, with parts on 4 shelves of this wire cart. Shelf held the computer, another the keypunch machine hooked up to it, another shelf held a monitor and the fourth had a bunch of cords and cable. It did not do much – this was 1975 or so – but I still thought it was one of the coolest things I’d ever seen. Okay, fast forward to you, now you can buy a computer kit, either pi-top for a laptop or piCEED for a desktop and it was one of the coolest things I saw at ISTE (International Society for Technology in Education). You can buy a desktop kit for $150. This does not include mouse, keyboard or speaker. Since I have plenty of mice and keyboard laying around the house, I only ordered the speaker for $20. They say you can mount the computer on the wall, which is pretty interesting to me. It also comes with a stand if you want to be more boring. The computer uses Raspberry Pi and it looked pretty easy to put together. I’ll tell you when it arrives. It runs anything that would run on Unix, according to the nice hardware engineer at their booth. She said that Chromium (the open source alternative to Chrome) runs fine on it, giving you access to Google apps and it comes with Libre Office, which is an open source version of office. 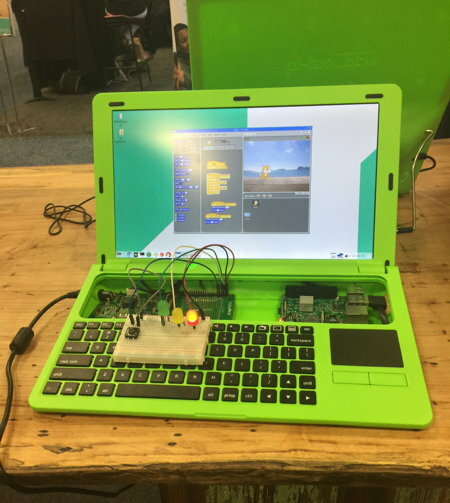 The pi-top laptop looked as if it would handle getting knocked off the table by kids running through the room and its keys would be hard for curious little fingers to pry off the keyboard. The laptop is pricier at $300. With only 1 GB of RAM, that price is going to have to come down if they are going to compete with Chromebooks – and I even saw an ad at the Microsoft booth for $150 for devices running Windows. According to this article https://www.theverge.com/2017/5/2/15506378/microsoft-windows-10-s-os-operating-system-announced-features the lowest price device earlier this year was $189, so that may be with a volume discount. I will say, though, that the lowest end laptops I’ve used for beta testing our games in schools aren’t very sturdy and don’t last long around kids, which is why we don’t buy the cheapest models any more. So, pi-top and its desktop counterpart piCEED – looks really cool, seems sturdy and will make you feel like a real life super hero scientist. I’m ordering one now to put together with Eva, who is 9. I’ll let you know how it goes once it arrives.